On our first full day in the park, Sharon and Lucia hiked a trail that immediately revealed both the stunning natural beauty and human imprint. We started at an old homestead near the Log Slide, with sand cliffs plunging 500 feed to Lake Superior. We passed through a forested area with thin-trunked beeches, crimson tinged sarsaparilla, maples and wild blueberry bushes. We finally arrived at the Au Sable Light Station and climbed the spiral staircase to the top. From the tower's narrow deck we studied the brick outbuildings, an old shipwreak and the brilliant water. We made this slinkey style book to capture glimpses of what we saw that day. The book was made on location. It is comprised of original images created equally by Sharon and Lucia. We used watercolor, prismacolor, linocuts and stencils. 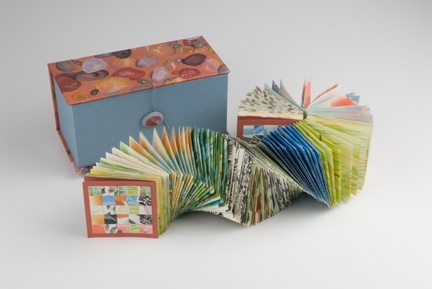 Lucia created the box from binders board covered with prisma colored drawings on Canson MiTeintes paper.